Antonio Vivarini (Antonio da Murano) (1445 — 1503) is an artist, one of their early representatives of the Venetian school of painting. In the early works of Antonio observed the impact of the teachers ' school of Andrea Murano and Gentile da Fabiano. The beginning of a dynasty of painters, which included his younger brother Bartolomeo Vivarini, and nephew last Alvise Vivarini. Italian painter, Venetian school mater. The son of a glassblower from Murano, near Venice. He worked in Murano, Venice, Padua, carried out orders for the churches of Bologna, Brescia, Pesaro, and other towns of Northern Italy. 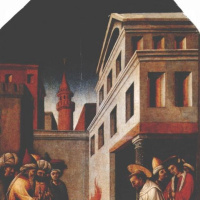 Headed a large workshop, where he worked at his brother Bartolomeo Vivarini (1432, Murano 1499, Murano) and son-in-law Giovanni d Alemannia (mind. 1450), studied his son Alvise Vivarini (C. 1445, Venezia — CA. 1503, Venice). Antonio Vivarini holds a special place in Venetian art 1440-1470. His artistic development was largely associated with the tradition of the Venetian late Gothic and George. da Fabriano. Constitute the bulk of his creative heritage large multi-leaf altars, enclosed in a carved Gothic frame, radiant gold background, saturation and purity is like a precious enamels blue, emerald green, Golden yellow, red, pink; like the masters of late Gothic Vivarini likes to write patterns brocade, precious stones; colorful chords, melody lines, jewelry thoroughness with which the written form, there is a special elegance. At the same time, he took in the late Gothic style in its most secular and close to the character of Venetian culture of the XV century, features that tells him the altars of pure Venetian splendor, entertainment, festive, decorative wealth. He prefers a refined Gothic style is calm and clear drawing lines, harmonic consistency of rhythm, the vigorous, almost sculptural modeling of forms, often gives his characters the guise of a beautiful Princess or elegant dandies in modern clothes. After borrowing some features formed during his life of the Venetian Renaissance school of painting, Vivarini, in turn, found in Venice in the XV century successors, the most notable of which was Crivelli. Major works: the Altar of SV. Sabina (1443, Venice, Church of San Zaccaria; in collaboration with Dzh. d Alemannia), Madonna enthroned (1446, Venice, gallery of the Academy; in collaboration with Dzh. d Alemannia), the Altar of St. Ursula (1450, Brescia, Church of Sant'angelo), the Altar of the Certosa (1450, Bologna, Pinacoteca; together with B. Vivarini), the Altar of the Pesaro (1464, the Vatican, Pinacoteca). In 1448-1451 Vivarini with the help of John. d Alemannia, after the latter's death together with B. Vivarini painted part of the vaulting and walls of the chapel of Ovetari Church of the Eremitani in Padua (frescoes perished during the Second world war).